The Moustache Samedi 27 Off 2 is a gritty performing hardtail eMTB with plenty of attitude! Similar in specification to its brother, the Xroad, the Off range from Moustache are more agile performers. In addition, they’re lighter as they have foregone mudguards and rear carrier. What they haven’t compromised on is performance or looks. Beautiful in design, the upturned motor fits seamlessly into the chassis. The huge 500Wh battery is semi-integrated into the frame, with a robust clip cover that maintains smooth lines. The look and feel of the Samedi 27 Off 2 is simply quite stunning. Suitable for an array of applications, the Samedi 27 Off 2 is not just a great trail bike, but an everyday ride too. It’s a simple ‘hop on, hop off’ ebike with huge appeal. Great in a variety of environments and terrain, the Samedi 27 Off 2 feels extremely comfortable in the forest, on canal towpaths and on just about any trail of any description. Furthermore, the Off is ideal for nipping into town, running errands or for simply having fun as and when the need arises. The all round nature of the 27.5″ tyre is at the heart of the Off 2. Fit a pair of Hutchinson Python tyres sporting a plethora of mini studs, and the end result is a tyre with excellent roll but with equally good comfort and traction. Hard tarmac roads, railway cuttings, canal tow paths and loose ground are easily dealt with. It’s strong too. With Moustache exclusive 27.5″ wheels (23mm wide) double cavity welded asymmetrical rims, the Off 2 can deliver great performance. Also, the rims are tubeless compatible, if that’s the preference! A nice pair of XCM ATB forks with 100mm travel ensure versatility and ease of adaptability, whatever the terrain. A wide 11-36T cassette ensures broad gear ratios and easy hill climbing. A Shimano Acera 9-speed derailleur works a treat on this stunning eMTB and makes light of any hills. Working in unison with Shimano Rapidfire shifters, means gear changes are slick, clean and true. Shimano MT200 hydraulic disc brakes are powerful, being both progressive and responsive. A suspension seatpost is a welcome addition to this nimble eMTB! 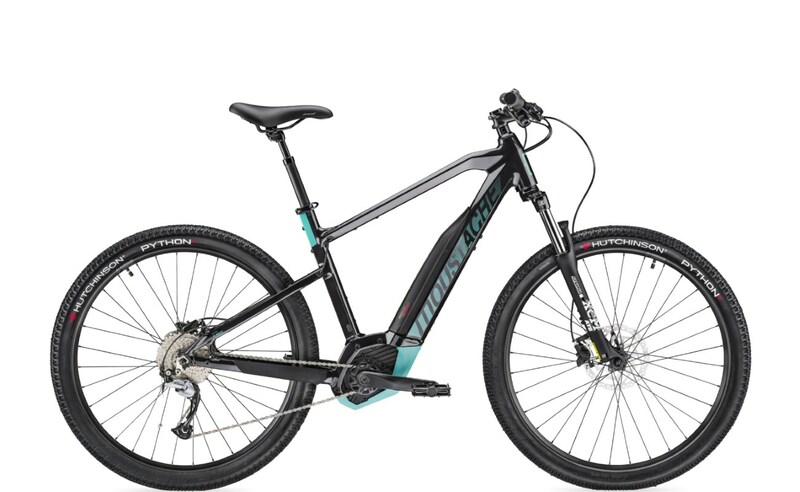 The Samedi 27 Off 2 is an ultra cool hardtail eMTB with striking looks and superb performance.